We're starting to see the light at the end of the tunnel. Not only is spring around the corner with a balmy 37 degrees feeling like 65 yesterday but we could possibly have a working kitchen in over a week! Someone pinch me! 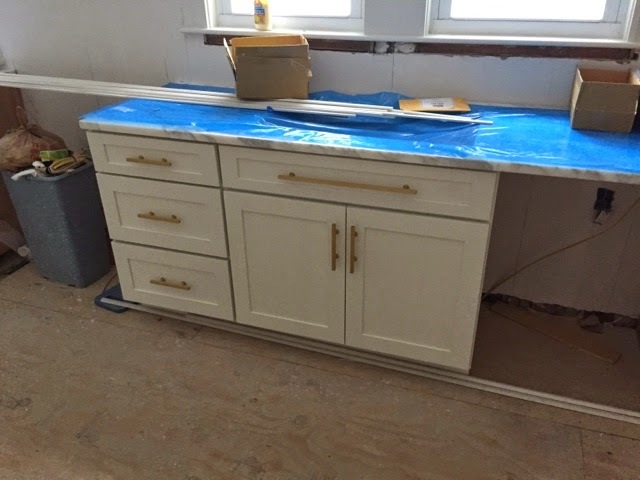 I've had my head buried in houzz and snow and haven't had time to take a moment to absorb what's really happening until we started putting things into the new cabinets. My DR was starting to look like an episode of hoarders and I just couldn't take it anymore. Next phase is tiling! 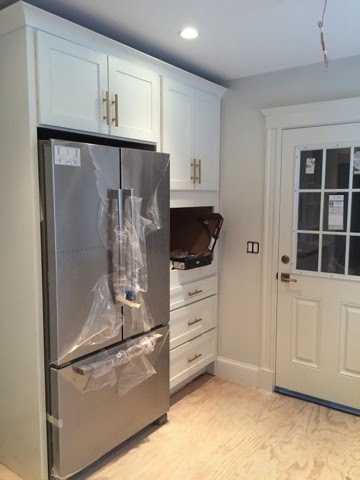 I'll write a post later on how to survive a kitchen remodel (while getting 8ft of snow). Everyone keeps telling me it will be so worth it and I really tried to believe them as we kept getting pummeled with snow, stuck inside with no kitchen and no school for days or what felt like a month. It was when I was drinking wine out of a dixie cup that I realized I had hit a low point. Anyway I was just too lazy to wash a real cup in my shower. Maybe I should keep the wine and glass in the shower and that would solve all my problems. Enough of my dixiecup drinking problems. Back to the sneak peek of the kitchen. I have to admit, I get such a big smile on my face when I see my counters and give my husband a big hug (thanks for letting me splurge honey) and then hug the counters. I literally stare at them, like when you have a newborn and you stand above their crib just staring. Hubs get's it though. He's allowing me to create a dream of mine....designing a kitchen! In fact, I may even be rubbing off on him. As we were trying to decide on light fixtures he's like "why don't you just order both colors?" why, only if you insist honey. We have a lot of little things to work out on the designing end but so far I've been really happy with how everything is turning out. Once it's all done, I'll share all the before and after pics. In the meantime here's a little sneak peek. 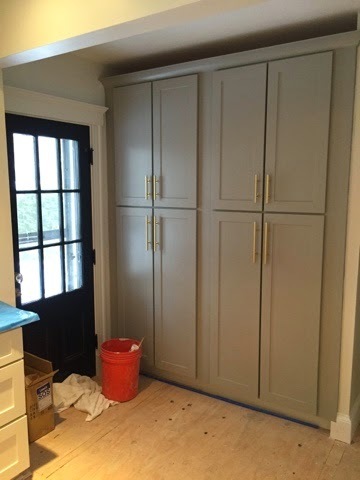 We knew we wouldn't be able to do upper cabinets on this wall because it would have looked off. 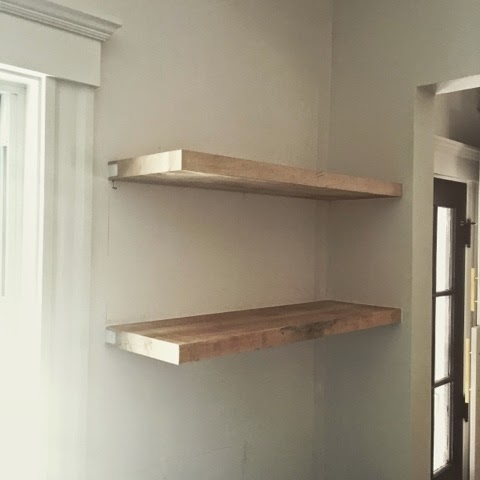 I've always loved the look of floating shelves so this is the direction we went. I'm all about saving and reusing pieces around the house. 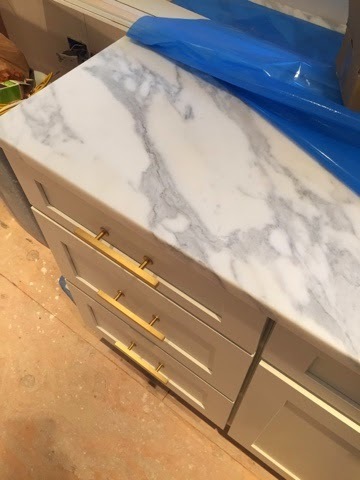 The previous owner (an interior designer herself) had great taste for her era and used high end materials, including the butcher block countertops. So we had our old butcher block counter tops made into floating shelves. They honestly look gorgeous just sanded down but I'm debating whether I will stain or paint them. I was originally thinking a wood stain to warm up the space but carpenter is worried they won't stain correctly. Thoughts on wood vs. white? I could not make up my mind about the darn handle under the sink. It's a pullout sponge holder so I needed something bigger. I went to run an errand to think about it and came home and it was already attached so that made my decision easy and I love it. Thank god because I would have thought about that placement for days! There is nothing we are more excited about then retiring the old college fridge that was housed on the porch. Good old Brewster gets to go back to what he was made for. Our new beer fridge in the garage. These are just a couple peeks and I can't wait to share with you the finished product.